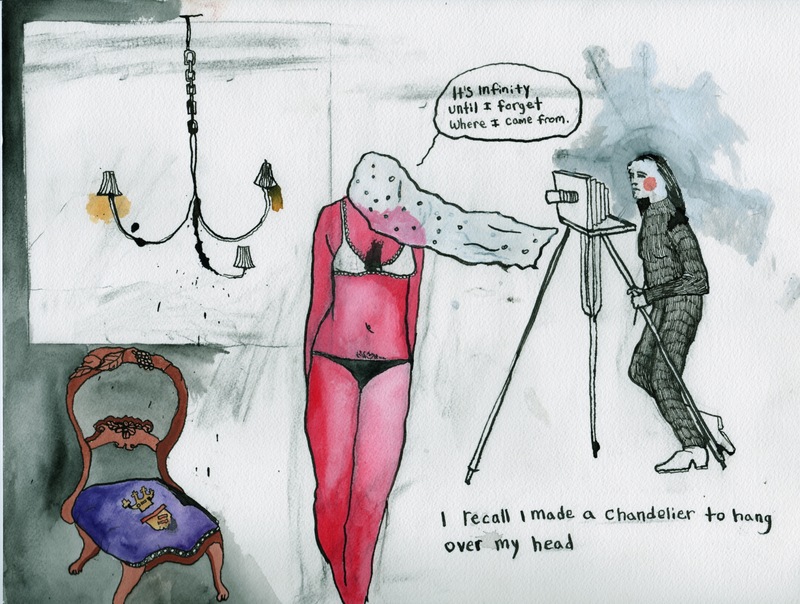 Bianca Stone is an amazing poet/comic creator/illustrator/hybrid/amalgam artist who, yes, changes the weather a bit because she goes where she pleases, much like Anne Carson, with whom she collaborated on the book Antigonick (New Direction, 2012), Carson’s translation of Antigone. Stone has a new book just out, Someone Else’s Wedding Vows (Tin House/Octopus Books, 2014), and she has great genes, being the granddaughter of the of the poet Ruth Stone. We have today an interview between NC’s own amalgamated poet/artist Nance Van Winckel and Bianca Stone, delightful and knowing. Note especially Stone’s analogy between drawing and the poem on the page. 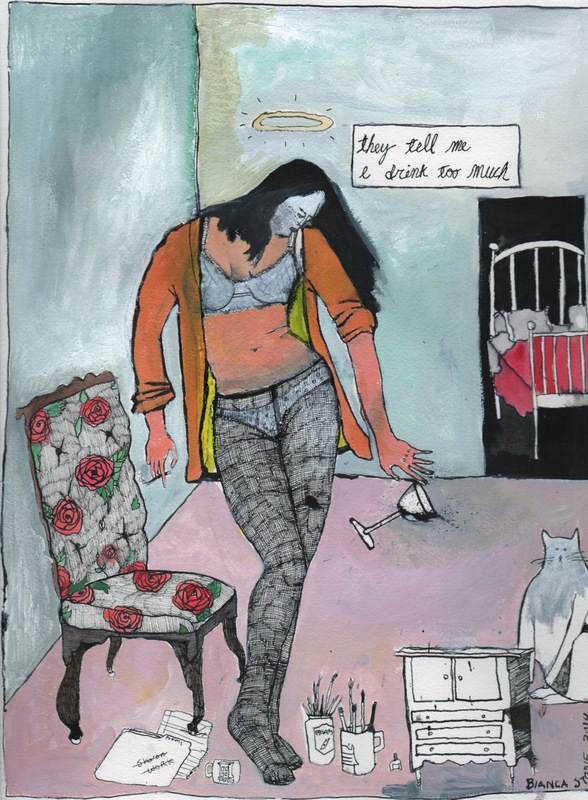 NANCE VAN WINCKEL: In some of your comics the text can seem suggestive of a state of mind, a thinking-feeling condition. I’m thinking of, for example, “It’s like there’s a house in my skull with a woman waiting for someone to resurrect and take her outside.) The artwork itself, however, often gives this more “lyric” text a kind of narrative context: a physical space, characters, and situation. Can you comment on your own sense of how narrative and lyric impulses combine for you—in process and/or technique? BIANCA STONE: I’ve always had a great love of narrative. But I prefer also to allow surrealism in to complicate the narrative. I think that’s just how our minds work. In my poetry comics it’s the perfect space to explore the two. You have the push and pull of the visual image (which is so much more immediate than words), and perhaps work against the literal. And against abstraction. That line you mentioned, for example—how could I possibly draw that without wrecking the imagination of it? I don’t want to draw it. I want to imagine it; more importantly, I want the reader to imagine it. So I draw something that lies beside it, so to speak, like another line of the poem. So that it moves forward, avoiding the didactic, the static. NVW: Regarding the Practicing Vigilance Series in Notnostrums. BS: I love that you imagined that the bat was bit of language. Because isn’t language, in a way, an image? Especially a poem—which uses the page like a canvas, and appreciates white space, the shape and sound of words, the drop at the end of a line. It’s beautiful for the eye (or perhaps hideous to the eye). And often I’ll use poems for a drawing that perhaps need a little more. That aren’t done enough to be on their own. I’ll be using a poem, and take a line out because suddenly, while it’s all alone on the page, I realize it’s not strong enough. Thus, it often creates the non sequitur method that you find in more experimental comics and poetry. But also that method resists the narrative and allows more for music. Some day soon I’ll be making a comic that’s much more narrative…that’s more a prose poem. BS: Again, one is constantly resisting “illustration, ” in its traditional definition. You don’t want to draw what’s being said, because that’s redundant. It’s damned abstract to talk about, frankly. An image as a line in poetry—it doesn’t make entire sense! But I believe it. NVW: Regarding Antigonick, your collaboration with Anne Carson, is it true you didn’t even see her written text until after you’d done the illustrations? But of course you no doubt knew the play. Did you come away from this project with any new understandings about the collaboration process? BS: Not entirely true! What I did see (read, spend hours with) was Anne’s text. I had it beside me while I did the art. I worked from it, as I do with all my poetry comics. However, Anne and Robert Currie didn’t show me the hand-written text until I was finished. And then Currie magically came up with a method to put the images and text together. Collaboration is hard. Very hard. You make endless false starts, and you spend a lot of time alone, weeping internally, worrying about everything. But then you come together and put things together like a couple of curious, eager architects. You step back and you have this one giant product. And you’re so proud. Your ego isn’t too wrapped up in it, because you all did it together. It’s something that you do with people you trust artistically, and emotionally. And it makes you a better, more humble person. 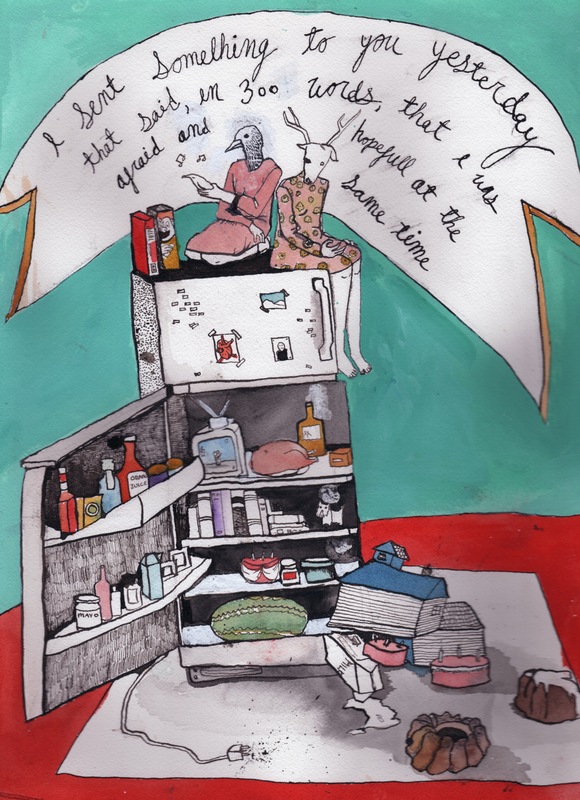 NVW: I loved the poem “Elegy with Judy Garland (and Refrigerator).” I so admire how the language synchs with the music and the graphics. The intermix of drawing and film, of music and voice-over make for one of the better poetry videos I’ve seen. Does the poem come first, and then the animation take shape around that? And is poetry video a main direction for your work these days? BS: I’ve always loved making videos. Ever since I was a teenager and had a massive VHS camcorder. The past few years I’ve been doing it again, and it’s really something I’ll keep doing. 1. Use a good, finished poem. 3. As I preach in my poetry comics, avoid “telling” the poem. Let the poem speak for itself. Use ghosts of subjects in your poem, but not verbatim. Thinking of the video-making process as part of it will slow you down, and help you make a better video. A lot of poem videos are kind of awkward…it’s important to pick the right tone (music, sounds, title font, footage). NVW: I know you’re the granddaughter of Ruth Stone, a poet who’s near and dear to my heart, and I know too that you’re running the foundation to make her Vermont house a writer’s retreat and artist space. Could you talk a bit about how her life and/or her poetry have influenced your own? In your video, “Because You Love You Come Apart,” I could swear the first voice is Ruth’s. BS: YES, the first voice is grandma’s voice, with me pantomiming it. She was an amazing reader. Well, how to begin with this….grandma’s poetry is the most important poetry to me in the world. Her voice, her words, her love, is why I’m a poet. I’ve written a lot about it. But to kind of sum-up, I spent my childhood with her (living with her in Binghamton while she was teaching there, traveling to readings, spending summers with her in Goshen, VT). We wrote together all the time, read her poems out loud; created together. I was raised by a single mother, so we spent a lot of our life dependent on my grandmother. My whole maternal family really revolved around her. Since her house in Vermont has always been a haven for her writing, and for students, poets, artists (and of course my mother and aunts), I’ve always dreamed of making it into a writer’s retreat. Sadly, the house needs about 500,000 worth of renovation (it’s also a historical landmark, so that price includes the parameters of restoring such a house). People tell me to tear it down, and I just want to scream! I wouldn’t dream of it! I’ve been toiling away with whoever will help, raising as much money as we can, trying to save it. All her writing and books and my family’s history is in there, getting eaten by mice and consumed by the elements. This summer I’ll be up there full-time. I’m going to get married there! Honestly, anyone who can, please donate here at the Ruth Stone Foundation site and read more about what we’re doing. 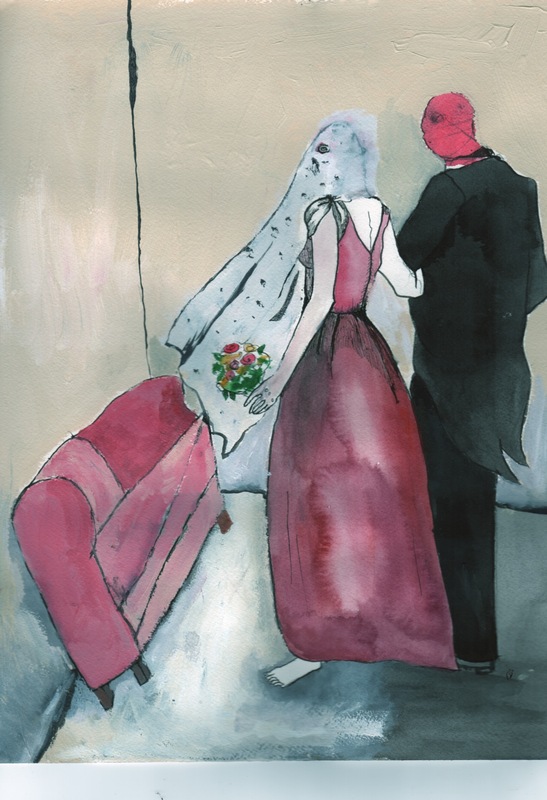 NVW: I know you have a new book, Someone Else’s Wedding Vows, just out with Tin House/Octopus Books. Does it include visual art? 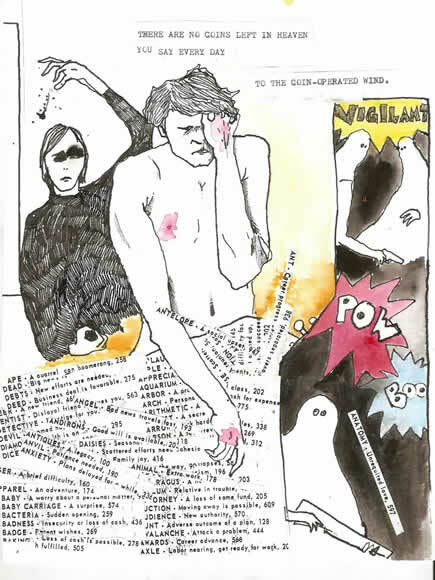 Or did visual art—your own or others—inspire the poems in the book? BS: I did the cover. (Which, I at first said I wouldn’t do, because art sometimes trumps words.) But besides that, it’s all about my poems. However, you’ll notice in the book that several poems are also poetry-comics and/or poem-videos out in the world. I’ve been looking forward to my first book for a long, long time. I was patient in the end, waiting until I had it right. Now I’m thrilled with the whole trajectory of my poetry. I just wish grandma were here to see it. Bianca Stone grew up in Vermont, and graduated with an MFA from NYU’s Creative Writing Program. She is the author of Someone Else’s Wedding Vows (Tin House/Octopus Books, 2014), several poetry and poetry comic chapbooks, and is also the illustrator of Antigonick, (a collaboration with Anne Carson). Her poems have appeared in magazines such as American Poetry Review, Tin House, and Crazyhorse. She lives in Brooklyn. Nance Van Winckel is the author of six collections of poems, including After A Spell, winner of the 1999 Washington State Governor’s Award for Poetry, and the recently released Pacific Walkers (U. of Washington Press, 2013). She is the recipient of two NEA Poetry Fellowships and awards from the Poetry Society of America, Poetry, and Prairie Schooner. Recent poems appear in The Pushcart Prize Anthology, The Southern Review, Poetry Northwest, Crazyhorse, Field, andGettysburg Review. She is also the author of three collections of short fiction and a recent recipient of a Christopher Isherwood Fiction Fellowship. 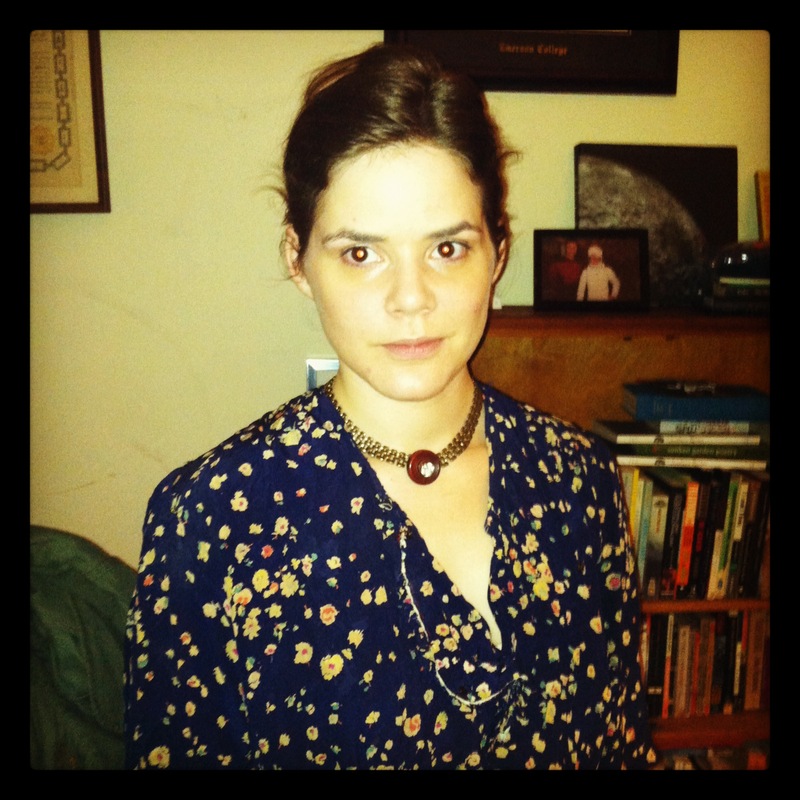 Her stories have been published in AGNI, The Massachusetts Review, The Sun, and Kenyon Review. Boneland, her fourth collection of fiction, is forthcoming in October from U. of Oklahoma Press. Nance’s photo-collage work has appeared in Handsome Journal, The Cincinnati Review, Em, Dark Sky, Diode, Ilk, and Western Humanities Review. New visual work and an essay on poetry and photography are forthcoming in Poetry Northwest and excerpts from a collage novel are forthcoming in The Kenyon Review Online. Click this link to see a collection of Nance Van Winckel’s mash-ups of poetry and photography, which she calls photoems. She is Professor Emerita in Eastern Washington University’s graduate creative writing program, as well as a faculty member of Vermont College of Fine Arts low-residency MFA program. She lives near Spokane, Washington with her husband, the artist Rik Nelson. Her personal web page is here.